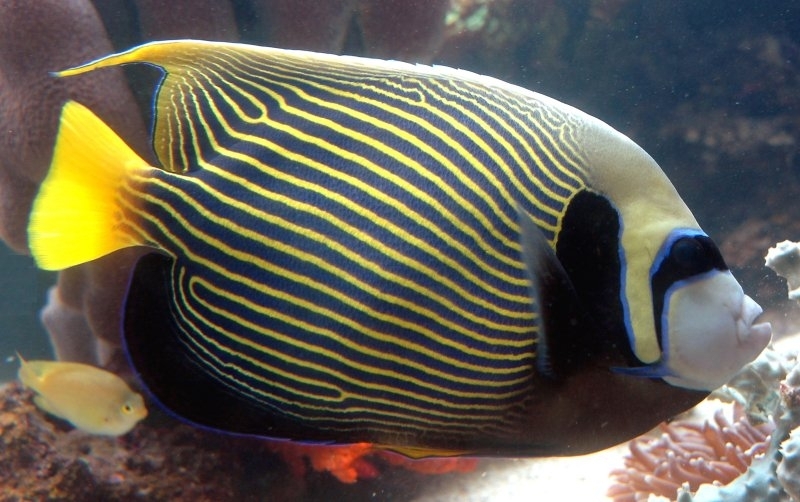 Do you know about the Emperor Angelfish? In fact, while the adults display very bright colours and diverse patterns, the juveniles are darker with white and blue stripes crossing the body. Adult individuals have thin blue and yellow stripes covering the whole body, a bright yellow tail and dark blue fin. Their mouth is white and a blue-black mask covers the eyes. It can reach up to 40cm length, but much less if held in captivity. The emperor angelfish is distributed all the way from the Indian and Pacific Oceans to Eastern Africa and can be found in the Red Sea and the Australian Great Barrier Reef. Juveniles prefer shallow waters, reef flats, and protected channels, while adults occur in reef slopes, reef channels and large lagoons. They can be found up to 70mt of depth and males rule over a territory of over 1.000 m².